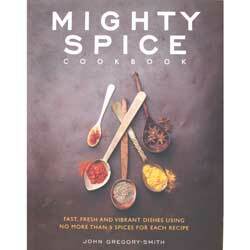 John Gregory-Smith brings us a wonderful collection of recipes from all over the world. Each recipe uses easy techniques and a maximum of 5 from the 25 key spices covered - and delivers fantastic tastes with minimum fuss. Want to make a chicken dish for supper, for example? Try Vietnamese Star Anise & Lemongrass Chicken Claypot, Mexican Chicken with Yogurt & Almonds or Moroccan Lemon & Cinnamon Chicken. Keen to explore new flavours for fish? Try Coconut & Lemongrass Salmon Curry, Chilli & Basil Scallops or Indian Fish Cakes with Coriander & Coconut Chutney. Many people find spices confusing and equate them to endless shopping lists or old jars sitting in their kitchen cupboard. Mighty Spice Cookbook will change these misconceptions and show everyone how simple it is to cook with spices - and create mouth-watering recipes, full of flavour. "Dear Spices of India, Thanks so much for my order,it arrived so fast..."